Cut off time 11 AM. Eastern. Estimated ready date 05/09/2019 Please not estimated data may not include proofs, extra option or graphic design. 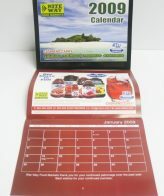 Full color 28 page calendars 8.5×11″ with 11pt Cover closed with drill hole. Minimum order 200. + Basic setup is use of stock backgrounds, supplied background or standard color background. We will also place your logo or supplied design on 13 months and on cover.